Stuart Broad will miss England's one-day international and Twenty20 matches against Sri Lanka as he continues to struggle with tendonitis in his knee. The fast bowler, 27, who is England's Twenty20 captain, hopes to be fit for June's Test series against Sri Lanka. Nottinghamshire bowler Broad said: "I'm just having a little bit of time to get my knee 100% right." 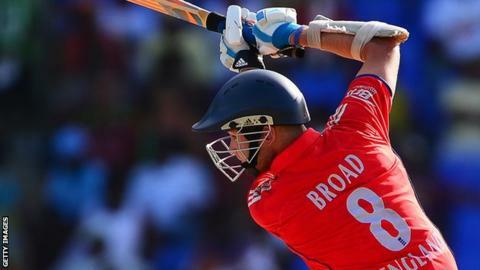 England play a T20 match and five one-day games against Sri Lanka between 20 May and 3 June. "I've played a lot of one-day cricket over the past four months when a lot of the other guys were resting after Australia," Broad continued. "[I'll] hopefully be back for the seven back-to-back Tests, five against Sri Lanka, two against India, and the one-day series at the end of the summer. "You can never say definitely with England shirts but I'll definitely be in a Notts shirt on 25 May, pushing for an England shirt in that first Test match against Sri Lanka." Broad has just over a month to overcome his knee problem with England's first Test against Sri Lanka on 12 June at Lord's.